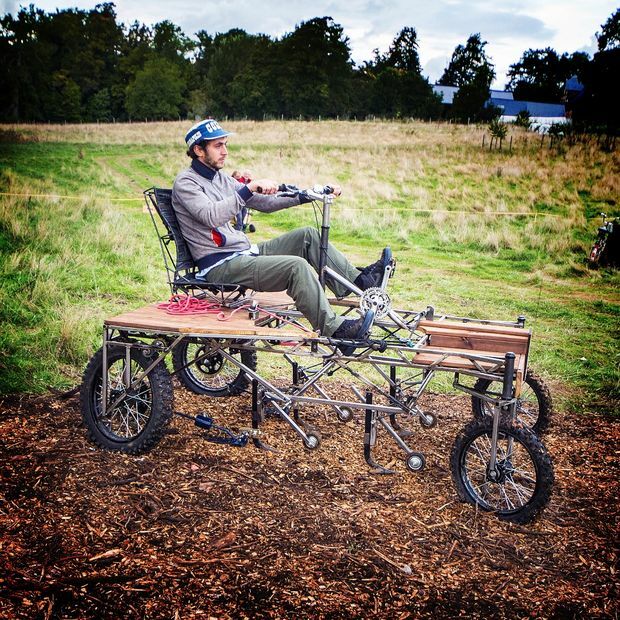 From our friends at FarmingSoul, an alternative approach to the pedal-powered tractor (similar to the Culticycle). Below we link to the Instructables page, and also have embedded the final AGGROZOUK plans just finished by the FarmingSoul team and L’Atelier Paysan. With the electrical assistance the tractor can move at 4-5 mph max in the fields without power needed for the tools, perfects for mechanical weeding. It should be able to tow a little trailer with 300-400 lbs on it in the fields. The AGGROZOUK is a tool that allows farmers with agricultural holdings of medium size to mechanically perform tasks which are difficult to perform manually and can cause physical strain. In addition to being a tractor that does not release carbon dioxide, because it does not use fossil fuels, it is an open source vehicle. That is to say, these manufacturing plans are available for everyone free of charge and so everyone is able to make, for themselves, an effective non-polluting working tool, which is easy to manufacture at a cost of less than 1500 Euros. Plans Bicytractor: Updated design plan for the latest Bicitractor model. Farm Hack Manchester from Squirrel Nation on Vimeo. The slides from Day 1, including the schedule, are here. 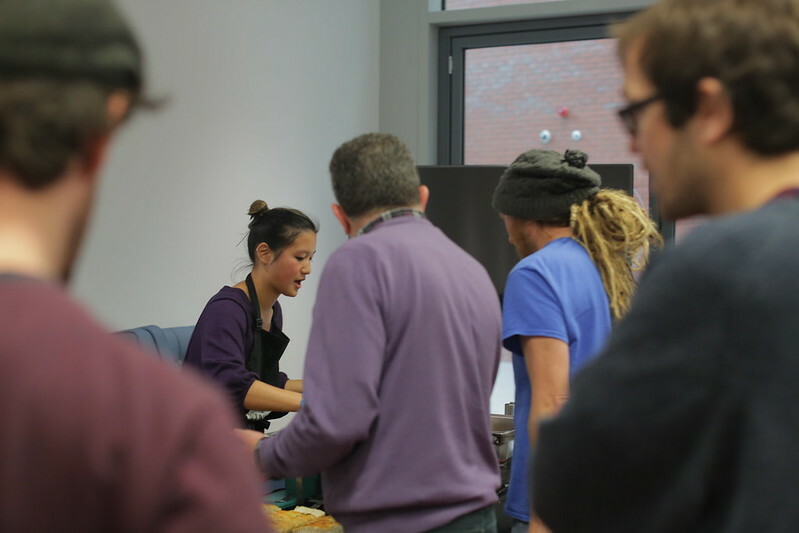 The event was hosted and run by Erinma, Caroline and Franco from Squirrel Nation with Paulo from Aquaponics Lab and Anne from Manchester Science Partnerships. 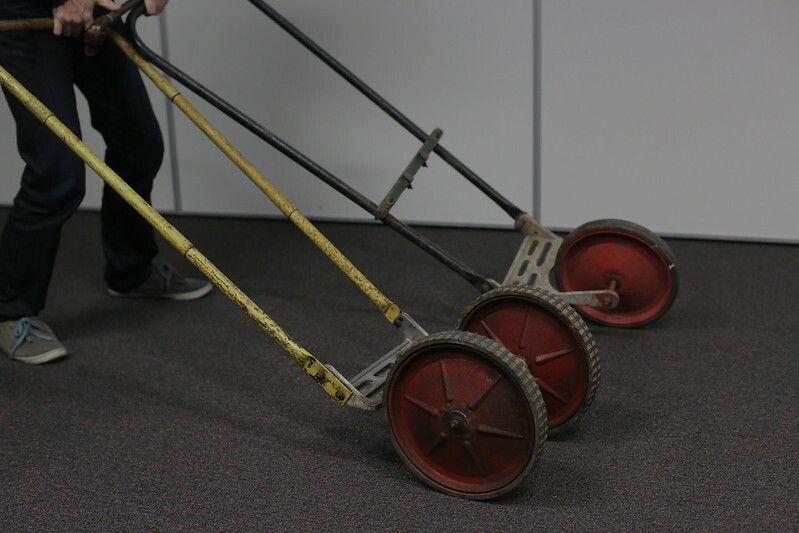 Team Mulch – innovate wheel hoes to help lay down black plastic to save time, stop back pain and see off weeds. The Sniffers – designed an ammonia sensor to help keep the fish healthy and save time for Aquaponics farmers. Team Family of Vegetables – designed an app to coordinate orders and create a community around crop harvesting. Chris & Dave from Team MulchEveryone pitched their solutions at the end of the day before a cold yorkshire beer. Thanks to a small grant from The University of Manchester, we have a shared pot of £200 to allocate across the teams to create help create their prototypes. But of course we are encouraging teams to be resourceful. Next week, the teams head to FabLab Manchester to fabricate their designs. We’re encouraging the teams to document their tools and their ‘how to’ guides on the Farm Hack website. Check out existing tools here. Plus there will be a film by Franco documenting the two days of Farm Hacking. Next stop FabLab! Huge thank you to Anne Dornan at Manchester Science Partnerships, Lauren at CityLabs reception, our two fabulous Manchester Science Festival volunteers, Colin & Karina and to Amy from 4Lunch for the amazing food and cake. Welcome to Installment 2 of Community as Process. Last week we introduced three new wikis to the Farm Hack site: a new culture page, a farm hack methodology of documentation, and the recently updated getting started guide. Like everything documented on Farm Hack, these wikis are openly editable by the community–our intention is that they will be functional, usable documents, and that they will spark conversation and input by a broader swath of community members. Each of these pages has an associated forum which will host relevant conversation: Culture, Method, and Getting Started. As a facilitation team, we want to create a public space where these significant conversations can happen. The forums are a great place to share feedback and conversations so that the entire community can benefit. Last Fall, a group of Farm Hack community members circulated a survey to help us create a foundation for our collaborative work. The purpose of this survey was to organize ourselves around our commonalities and to discuss them. The result has been an understanding among ourselves of the kind of community we want to take part in and help to facilitate–a philosophical banner to rally behind. We extracted a working document from the survey responses and posted it as a wiki; it’s called Vision, Values, Strategy, and Goals. We invite you to offer your thoughts, and reach out to us to participate. Feel free to comment offering general feedback about this document as well as to address the specific questions. In the next few weeks, we’ll revisit the topics and documents covered in the first installment of the Community as Process series. As we post this content, we are working to refine it, make it appropriate and useful, and frame it in ways that will best serve our community and ourselves as a facilitation team. 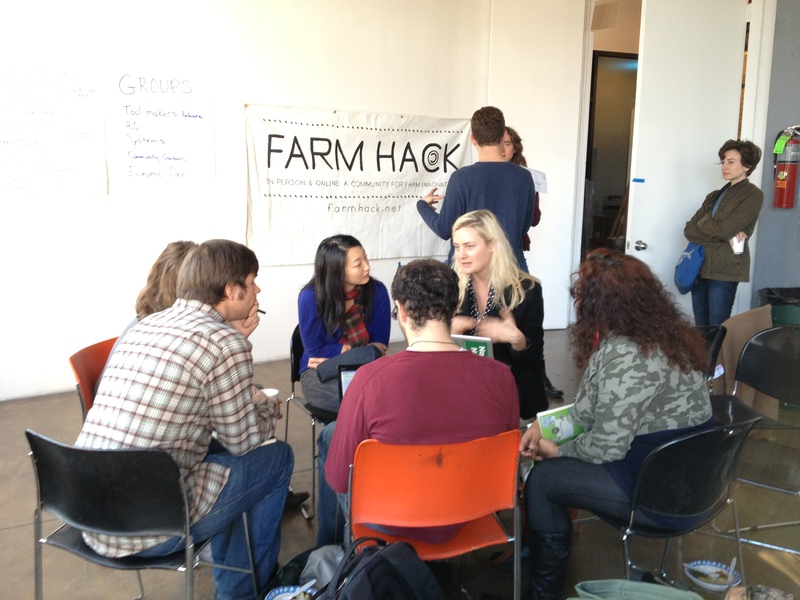 We plan to incorporate additional methods of user participation into the Farm Hack platform itself. 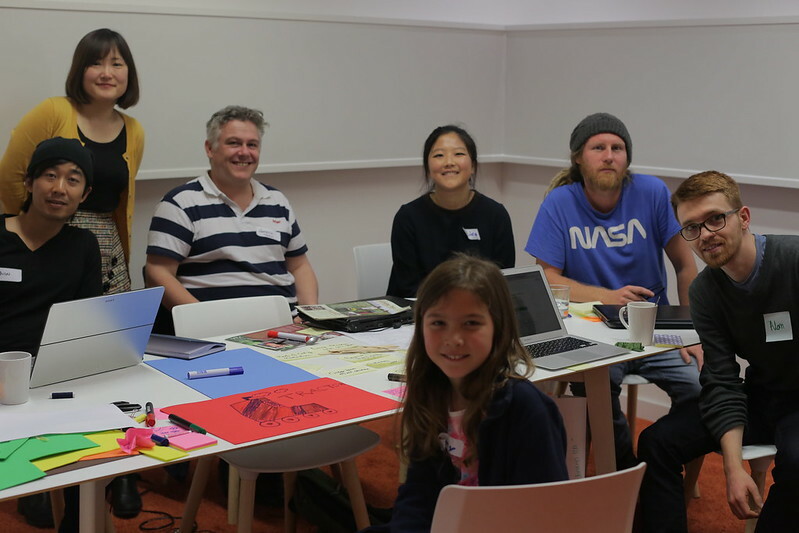 We will be collaborating with Public Labs to develop rich user profiles for our site, enabling each user to tell their story and display their involvement in the Farm Hack community. Welcome to our newly launched weekly series! Our goal is to share the conversations and philosophies which we (the Farm Hack facilitators) use to move this community forward. Transparency is foundational to the philosophy of our community; and dialogue throughout the community cannot happen if information (whether it be tool documentation or organizational and strategic planning) is siloed. To learn more about where we think we’re headed and how you can engage, read on. On recent Farm Hack organizing calls, we (the Farm Hack facilitators) have been talking a lot about how to make Farm Hack’s organizing processes more collaborative and transparent. Farm Hack is first and foremost a community of peer production and open-source exchange, better conceived of as an association of collaborators than a traditional non-profit organization. The human and technical infrastructure that supports the community—in-person events, the sharing of documentation, discussion in the online forums, and the platform itself—were created by people motivated by a shared belief in the Farm Hack mission and the desire to create something useful. Many, if not most, of these people have been volunteers; paid work and the exchange of money have not been the drivers behind Farm Hack’s growth. And we think that makes for a richer, more diverse, and more resilient community that can build and sustain itself according to the vision, skills and efforts of many people. Cooperation, association, and mutual aid are foundational to how we think and talk about who we are. But talk has its limits. It’s vital that our practice demonstrates our thinking. As Farm Hack matures and gets bigger, we need to update our processes accordingly. 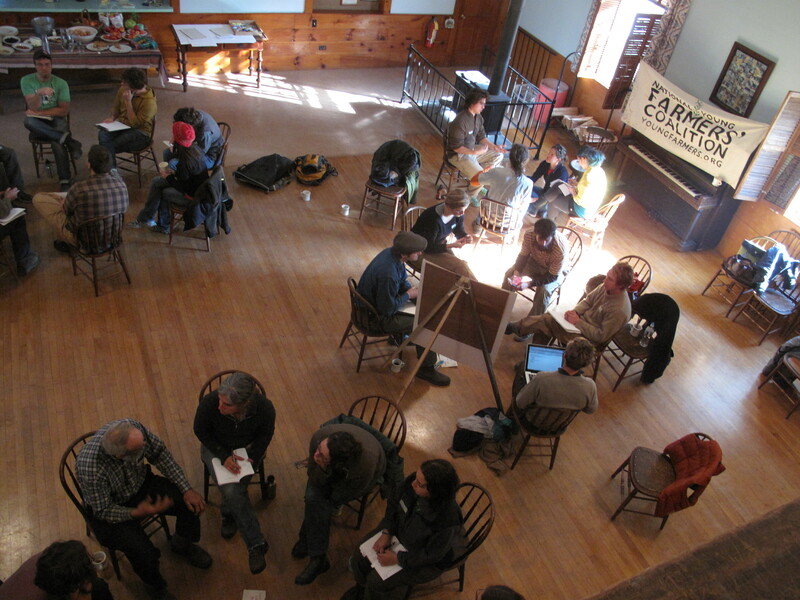 Based on lots of conversation in organizing calls and elsewhere, we think it’s important to put more practices and structures in place to allow everyone, both those newly discovering Farm Hack and the old hats, to: see what is happening across the community; feel warmly invited, and encouraged, to participate; and understand how to go about participating. It’s natural that there will continue to be a diverse mix of interests and capacities for participation within the community. But we hope that many will continue to participate actively however suits them best. Our community’s commitment to our values has brought Farm Hack to the place it is today, with thousands of registered Farm Hack users and hundreds of tools documented. There’s so much more we’re still excited to accomplish. Truly collaborative work can also feel (or be) slow. I am sure many of you have encountered a broken link or a disappointingly incomplete tool page on the Farm Hack site and perhaps wondered whose job it was to fix that. It’s not really anyone’s, and its also everyone’s – possibly yours. You, other platform users, casual visitors to the site, and contributors to in-person activities are all community members. The organizers and moderators of the community will work hard to make sure you’re empowered to contribute effectively. If you’re moved to do so, read the planning wikis; join the weekly organizers call; jump into Culture conversations in the forum (more are coming! ); submit some blog content; or, make that Farm Hack build event happen that you’ve been thinking about for the past year. Because that’s truly how this whole thing has been built so far. To this end, we (again, the Farm Hack facilitators) are going to start posting various strategic and planning documents in wiki format with associated Forum discussions. Because we want your feedback, and we want to spark more thought and conversation about what our community is, what it means and where it’s headed. This week we are also launching a Culture page to better discuss our thoughts on the “why” of Farm Hack–we aren’t just posting some cool tools in a vacuum, we are doing it for specific reasons and it means things. Important things. A lively and engaging discussion of those things is the purpose of starting a Culture page – so check out the working wiki, make some comments. Also living on the Culture Page is the Farm Hack Design Principles wiki. Documentation is our bedrock. Without it, Farm Hack wouldn’t exist. Knowledge sharing begins with the creation and dissemination of documentation. That’s why it’s so important to develop educational resources that empower our community members and help them produce high-quality documentation. That’s the main objective of this resource: to offer a how-to guide by illustrating the documentation process in the context of different sorts of tools and environments, including farms, events, and formal education. To start things off, we’ve put some work into the Getting Started Page, which discusses entry points into the Farm Hack community and how to navigate it. Go there to learn how to join organizer calls, contribute to the blog, or put on a Farm Hack event. More to come there. We are hoping to use the Farm Hack Forum to continue these conversations. We’ve started a couple, so jump on or create a new thread. Follow up on the SARE-funded redesign process we have been undergoing in partnership with UVM. Working on universal logins and rich profile development with Public Labs. Farm Hack Newsletter: Welcome to the shiny new Farm Hack tool library! 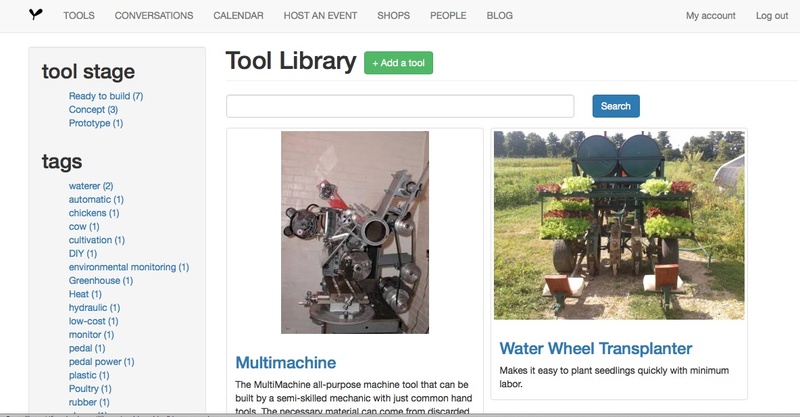 Shiny New Tool Library at farm hack.org! After receiving a SARE grant in partnership with UVM this past spring to improve functionality of our Tool documentation platform, this summer has been a big web development push for Farm Hack. We have just launched a re-design of the Tools section of the website. The new version is intended to make both documenting tools and finding the tool you are looking for easier and more effective. The new Calendar page integrates Farm Hack events as well as other events hosted by other the Northeast Food Knowledge Ecosystem (NEFKE) coalition. We are always looking for developers to join in on current and future projects. We meet weekly through Google Hangout on Thursday evenings. Contact info@farmhack.net if you want to join the call. There are heaps of useful tools out in the world that don’t exist on farm hack! Know some tools or some inventive farmers? Reach out to help them document! Then follow the steps on the Add a Tool page. Do you want to host a Farm Hack in your area? It’s not so hard with some help from local partners, farmers and Farm Hack’s Event Organizing wiki. This article appeared in the Spring 2015 issue of the Small Farmer’s Journal (Vol. 39 No. 2). Thank you to Jelmer Albada and Stephen Leslie for providing access to the text in digital form. When considering the potential utility of draft animal power on the modern 21st century farm, I like to begin from the perspective of examining those farm models where all the work was done by hand. That hand work was done with a lot of care and precision and with great attention to detail towards the soil and the crops (these methods persist in our times in small scale community gardens and among some subsistence farmers). I have heard about, read about, and also have first-hand experience practicing these cultural gardening techniques involving hand labor and find it useful and inspiring to use these methods as a springboard from which to examine where draft animal power can be most useful and where the hand work can readily be improved upon. My conclusion is that there are many areas where a horse can do a better job in replacing the hand work, and that live horse power will usually not be ”over-kill”, as could be the case by introducing a tractor into a relatively small-scale operation. In this light, the horse could be viewed as a four-legged employee of the farm, always ready to take on the big and small jobs. The event was hosted by the Landworkers Alliance, and took place at Ruskin Mill in April 2015. 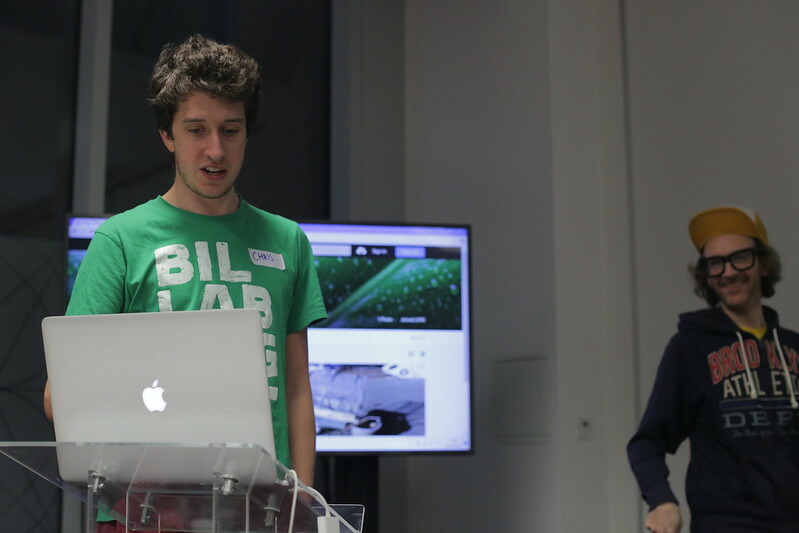 It was the first Farm Hack to be hosted in the UK. Join Farm Hack at the 2015 Draft Animal-Power Field Days! September 24-27 in Cummington, MA. Farm Hack will host a workshop session on Saturday from 1:30-3:00 as well as a weekend-long build project focused on integrating draft and human power into standard vegetable production systems. Event page here. The Homesteader is a new draft-powered multi-tool by Amish equipment manufacturer, Pioneer. One unique feature of the Homesteader is a unique quick hitch which makes switching the belly-mounted tools a snap. Our goal is to adapt this quick hitch mechanism for use with the Culticycle, a pedal-powered cultivating tractor. Culticycle inventor Tim Cook will bring a Culticycle and several of the hand built tillage tools he’s been working on. See here for documentation of the Homesteader quick attach on Farm Hack. Tractor-powered vegetable farms typically grow on a bed system that utilizes beds between 48″ and 60″ wide, growing most crops in multiple rows within the bed. Most horse-powered vegetable growers use a single-row system at 32-36″ spacing. 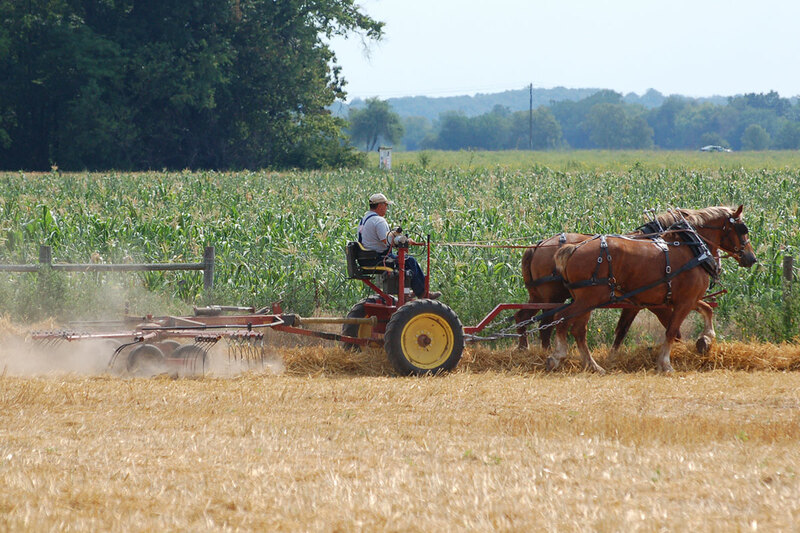 This is because most horse-powered equipment available was designed for growing row crops such as corn. At the DAP Field Day, we will explore the possibility of adapting a single-row riding cultivator to fit the wider bed-system spacing, with the goal of improving space efficiencies in horse-powered operations, and allowing the easier integration of tractor and draft power within a single farming system. There are three crucial components to adapt a single-row cultivator for wider beds. First, the cultivator wheel-base must be widened. The wheel base on most cultivators is already adjustable, typically from 34-42″ but the adjustable axle will have to be extended as well as a linkage at the front of the cultivator. Second, a wider evener and neck yoke will have to be built to spread the horses apart. Third, team lines will have to be configured to spread the horses apart. See the recent conversation about this topic on the Draft Animal Power Network forums. This post was originally published by No Tech Magazine. The original article can be found here. As a result of the industrial revolution and the subsequent development of “big agriculture,” small-scale farming tools have become almost obsolete. In order to fulfill the demand created by a burgeoning community of small-scale farmers, Stone Barns Center has partnered with Barry Griffin, a design engineer, to develop farming equipment and tools. Called the Slow Tools Project, this partnership brings together leading engineers and farmers to design and build appropriately scaled tools that are lightweight, affordable and open-source. They have identified 34 tools in need of development, beginning with a small electric tractor that will serve as the “motherboard” frame to which other tools can be attached. Other inventions to follow will be the solar-powered “Horse Tractor,” which could have a significant impact among cultures dependent on draft animals and where drought limits water availability, and a compressed-air grain harvester and processor. 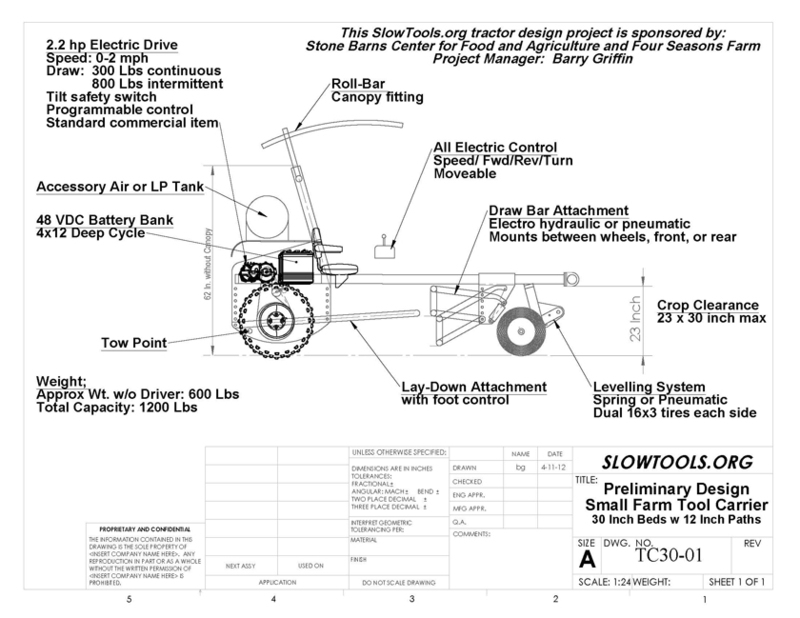 In the summer of 2015, The Slow Tools Project will focus on the development of a Bed-Former/Shaper powered by a BCS walking tractor; a hug-wheel driven, walken behind electric tool carrier; a two-layer clear plastic blanket for field-scale soil solarizing; and a 30-inch wide stripper/header to harvest grain for poultry. Slow Tools, Fast Change, Stone Barns Center for Food & Agriculture. Read more at the Farm Hack Blog. Light-weight farm equipment is already available from the Amish in the USA. For example, I & J Manufacturing, Pioneer Farm Equipment, and Heavy Horse Equipment manufacture farm equipment that can be drawn by horses, mules or garden tractors. For an overview of modern horse drawn equipment, check out this website. 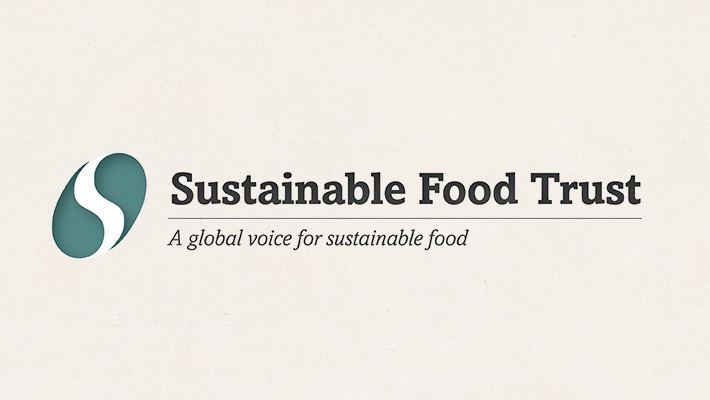 The original version of the post was published by the Sustainable Food Trust, and can be found here. New entrants to farming in Britain are often faced with a long list of challenges before they even put their wellies on. Defra’s 2013 report, Future of Farming Review, details a vast array of barriers faced by new entrants to farming, and highlights the shocking figure that only 8% of British farmers are first generation. Across the pond in the United States, a different phenomenon is occurring: the arrival of the Greenhorns. In farming terms, a greenhorn is a novice or new entrant into agriculture, and this grass-roots group aims to help them. The Greenhorns have been making waves with their 2014 documentary on young farmers, and they are helping to change the landscape of field-to-fork farming by using technology to organise and up-skill new farmers. Recently, the Greenhorns have developed a specific tool to help connect the diaspora of new farmers spread across the United States – it’s called the ‘Farm Hack’, and it has now arrived in the UK. ‘Farm Hack’ is a concept coined by the Greenhorns. Think ‘i-fixit’ combined with Wikipedia. Lots of problems – and lots of solutions – all on an open-source, easily accessible platform that allows members to interact, debate and build on each other’s ideas. Although the term ‘hack’ evokes images of computers with Matrix-style numbers flashing across the screen and a virus eating your computer from the inside out, it actually has myriad meanings. These range from the ability to cope successfully with something to breaking up the surface of soil. In recent years hack has also come to mean a congregation of people (either online or offline) aiming to take action or work together to solve a problem. Taking action and problem solving is exactly what occurred on a sunny spring day last month at Ruskin Mill in Gloucestershire at an event organised by the Landworkers’ Alliance. A group of farmers – some new entrants, some old hands – gathered together to find solutions to their shared problems. From Fife to Devon and Norwich to Pembrokeshire, farmers and those with technical expertise travelled from far and wide to share their knowledge and see how they could help one another address a wide range of issues faced on the farm. The Farm Hack was launched by Severine von Tscharner Flemming, the founder of the Greenhorns, with guests of honour L’Atelier Paysan, an innovative group of French farmers, that are reclaiming farming knowledge. 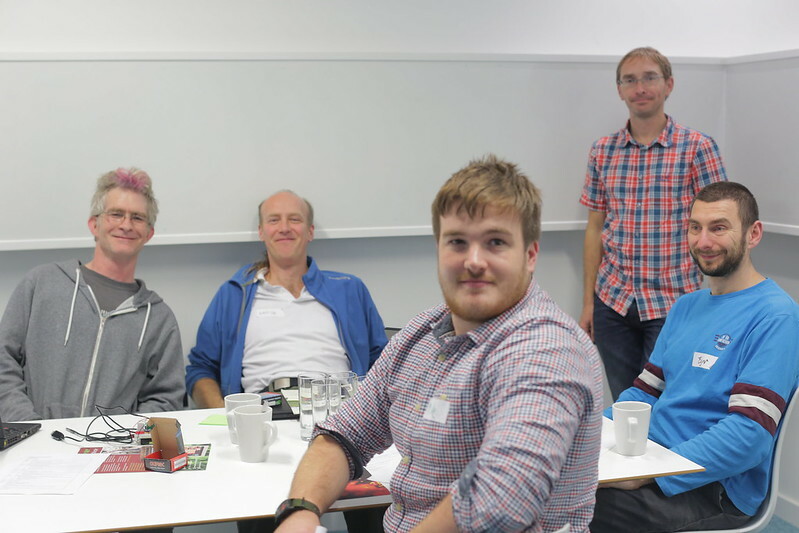 The Farm Hack got off to a flying start, with the attentive attendees ready to soak in the energetic atmosphere. The highlight of the morning’s demonstrations was a bicycle-powered mill from Fergus Walker and the Fife Diet. Coined the ‘People Powered Flour Mill’, it was an ingenious box that looked like a red rocket, and it ground wheat into flour at the turn of a pedal. The afternoon saw a host of inspiring workshops, covering compost tea preparation, 3D printing and how to set up food hubs with the Open Food Network. Alongside all this were welding, blacksmithing and green wood-working drop-in sessions. The second day felt like the crux of the event. It culminated in an extremely productive Open Space session that identified projects for collaboration, with a short period devoted to the development of these projects. 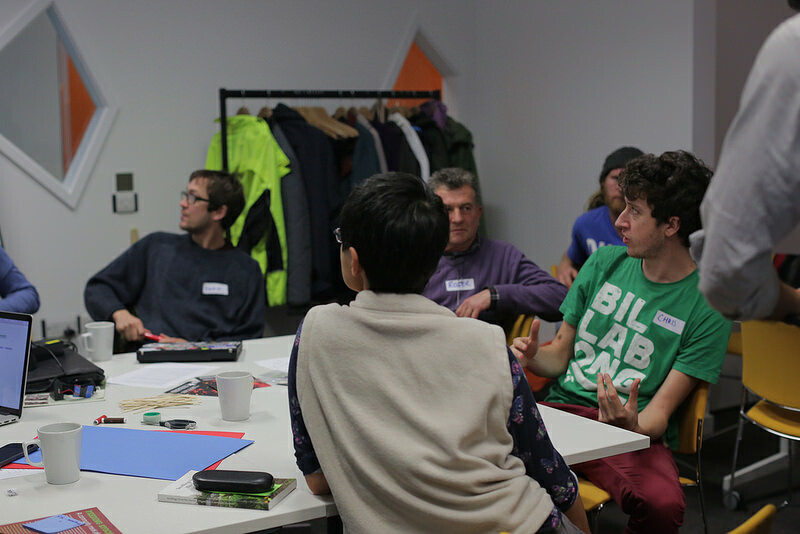 The Open Space session allowed attendees to get stuck into what they really came for – exploring their ideas, finding solutions and offering help to others. Suggestions were made for regional working groups to skill share and to create training and barter systems, as well as tapping into expertise outside of farming from engineers, CAD experts, coders, academics and architects. These other networks provided an alternative perspective on solving farming problems by framing the issues differently. For example, a blacksmith may have the expertise to fix a broken tool, but an engineer may suggest a different tool with a new shape or a different attachment to do the job better. It was a team effort – and if you didn’t know the answer, there was almost always someone in the room who did! Technology is often seen as the golden ticket to problem solving. But driverless tractors, drones and robots are not necessarily the answer (despite what the Daily Mail may want you to think). Instead, we need problem-solving tools that can make a real difference in the hour you have at the end of the day when you choose either to sit at the computer or water the tomatoes. The introduction of organisational tools such as Farm at Hand, Trello and the Farmhack wiki could potentially change the face of farming. Farmbrite is designed for record keeping and is mobile enabled so it is accessible out in the field. The Open Food Network and Farmdrop support small-scale farmers by connecting customers directly with producers in their local area. And there is Buckybox, an organisational platform designed specifically for community-supported agriculture (CSA) projects – my local grower at CSA Sims Hill Shared Harvest was raving about it over the seed beds a few mornings ago. These are tools that allow CSAs to manage their members without ever seeing each other face to face. One of the best ideas of the day was to invite older and more established farmers to share their expertise to help find better working systems. Meeting in real life rather than by email meant ideas could flow more freely, connections could be made and interests shared. Farmers need support through shared best practice as well as from new developments in the field. The wisdom imparted from established farmers who have seen it all before is incredibly valuable. Once this group of farmers got going, the ideas were flowing faster than Severine could note them down – a sign that a network of farmers, old and new, focused on solutions and assisted by technological tools is just what the future of farming might look like. This post was compiled by the Lexicon Sustainability for their Food List, a weekly bulletin of talking points to fix the food system. Farm Hack was a contributor to this edition of the List. Original post can be found here. Ever since Nixon’s Secretary of Agriculture, Earl Butz, proclaimed “get big or get out,” farms and farmers in the United States have followed the logic of corporate capitalism – bigger farms, bigger tractors, and more complex and expensive technology. A new corn harvester bought today costs about $400,000 and comes decked out with proprietary computer systems and GPS monitoring – the tractors can literally drive themselves, collecting scads of production data that happen to go right back to the large corporations manufacturing these machines. This technology makes combining a thousand acre field much easier, but it often puts farmers deep into debt and rests control of their own farming systems and production information from their hands. For smaller scale sustainable producers, the modern form of mainstream agricultural technology does not fit our function. The appropriate tools for our agriculture put biology before steel and diesel, are modular, adaptable, and designed for disassembly. We engineer systems instead of software, finding local solutions to local problems. Appropriate tools should not make a farmer obsolete – they empower the user to modify and improve upon age-old tools and ideas, or build something new using whatever resources they have available. Appropriate technology for sustainable farming is economically appropriate because it means retrofitting and using what you already have close at hand or getting it from your neighbor or local fabricator, rather than putting profit into the pockets of global corporations. It is environmentally appropriate because it harnesses the utility of our ecological systems while preserving and enriching them. It is intellectually appropriate because it reduces barriers to knowledge exchange, putting the best solutions in the hands of farmers. In this new paradigm, every farm is a research and development node in a distributed network of farmers, engineers, and technologists building a new economy from the ground up enabling independence through interdependence . Instead of homogenizing, privatizing and commodifying our farm technologies, we must support the time-tested tradition of on-farm innovation, and promote economically, ecologically, and socially resilient solutions. We must leverage technology appropriately as a tool to reduce barriers to information transfer and foster collaboration. On the outskirts of our conventional system of top-down manufacturing and proprietary tools is emerging a new community and a new paradigm – farmers, fabricators, engineers, and designers working together to build resilient, regionalized manufacturing economies. This is the movement we all must continue building together, for strong communities, healthy ecological systems, and good food. The future is open-source! In the age of technology, one with a very deep history in agriculture, there are many models and methods to apply and experiment with. In this week’s Food List, we explore the different ways in which small-scale farms are adapting technology to fit their modes. Most research and development in agriculture focuses on mass crop production, often forcing small farmers to “make it work.” They use technologies new and old. Farmers are collaborating with engineers across the country, like at Stone Barn Center, to develop slow tools for smaller operations. This is a solution for many food producers . As one small producer, Doug Mosel says, “the closer we get to using the last remaining “ancient sunlight,” the smaller and simpler technology will become.” By filling these technology gaps, smaller farmers have a better opportunity to focus on various other challenges. The beauty of this appropriate technology movement is the open source knowledge driving it. And so, when the latest sustainable design, such as the culticycle, becomes available, the technology can be found for free on sources like Farm Hack. Appropriate technology is not only about developing new technological adaptations for small farms. It’s also about using what you have around you as well. Draft animal power is still a widely used practice on farms. In fact, horse power is the symbolic standard for measurements of labor, especially on farms. Appropriate technology is about recycling the resources that you have around you. One story from Cleveland tells us of how appropriate technology extended the growing season into the winter. Fresh produce all year round in the four season states? And if you think that’s extreme, Low-Tech Magazine shares with us a dirty secretof the past that could be the “key” to sustainable farming. In this week’s Food List, we learn that farm technology is a greater quest for whatever works. It’s a matter of applying what makes sense, in the past, present, and future. How can you make appropriate technology work for you? Human excrement, most prominently used as fertilizer in earlier cultures, is reappearing as a soil amendment. The use of greenhouses to prolong the growing season. Seeds are planted earlier and the last harvest of the year comes later, allowing consumers to continue eating local foods longer than would otherwise be possible. Small farms need tools scaled to the size of their operations and specific to the tasks to be accomplished. The availability of ideal tools, priced affordably, would greatly aid the efficiency and competitiveness of local food production. Our group, Slow Tools, is focused on improving tool access for a rapidly growing group of small farmers — commercial intensive organic vegetable growers on 5 acres and less. This is a scale of production that has been ignored by tool manufacturers despite its impressive performance in yield and quality. 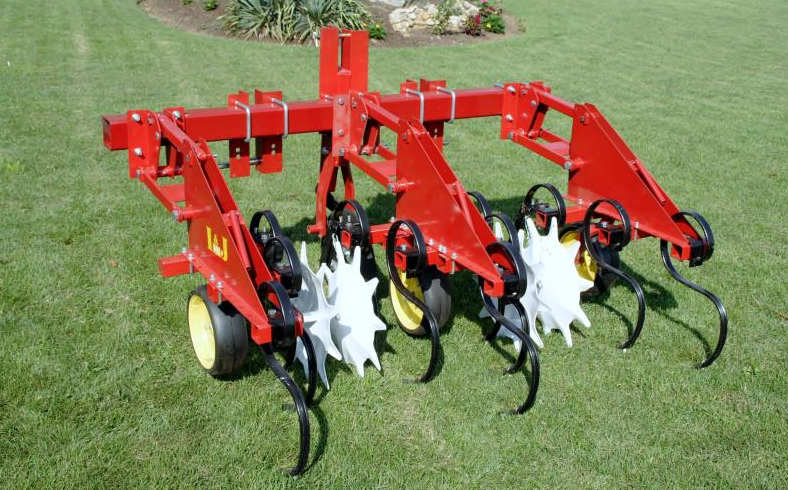 The many successful Slow Tool type implements that have been developed to date are presently available from the Johnny’s Selected Seeds catalog. These include the Tilther, numerous Broadfork designs, a complete Soil Block system, a Roller/hole-maker for transplants, the Six Row Seeder, the Quick Cut Harvester, and the Quick Hoops Bender. More are needed. Found on Page 146 in Local: The New Face of Food and Farming in AmericaAs farmers reintroduce wheat to strengthen their local food systems, they discover an alarming face: it’s hard to find equipment suited to small farms. Doug Morsel says that with wheat primarily farmed on an industrial scale, the local infrastructure to support the production of wheat has largely disappeared. The resulting scarcity of affordable, appropriately-sized equipment is the greatest challenge facing local grain production. This technology gap also applies to used cleaning and separating equipment as well as access to facilities that clean small quantities of grain. Doug and his combine lend a hand on his friends’ farm.Appropriate technology is environmentally sound technology designed to meet the social and economic conditions of a specific geographic area while ideally promoting greater self-sufficiency. Front Porch Farm’s “Tamalpais” barley; “Our idea is to harvest and malt it, then either distill it ourselves into whiskey or sell it to local breweries as a locally grown malted barley.” The HEDE 140 Combine is a “small plot” combine and is expensive, highly specialized, and manufactures in relatively small numbers. It’s usually used by universities or seed developers to harvest very small test plots that are not intended for production use. Don’t know where to start when it comes to finding the right tools for cultivating your small garden plot? Dig into this webinar, produced by National Center for Appropriate Technology’s ATTRA project and delivered NCAT’s Andy Pressmen, to find a comprehensive guide of tools for small scale crop production. Andy Pressman is a Sustainable Agriculture Specialist with the National Center for Appropriate Technology (NCAT), a non-profit organization that promotes and demonstrates small-scale, local, and sustainable solutions to energy and agriculture. Andy received a MS degree from Slippery Rock University in Sustainable Systems Design and has a passion for tools and equipment for small-scale agriculture. Through NCAT’s ATTRA Project – the National Sustainable Agriculture Information Service – Andy provides technical assistance and education to farmers and ranchers in the fields of organic crop production, season extension, urban agriculture, and farm energy. He and his family also operate Foggy Hill Farm, a small diversified family farm located in Jaffrey, New Hampshire. [Two weeks ago], an ace team of farmers, fabricators, engineers, and pedal-powered truckers gathered at Metro Pedal Power in Somerville, MA for a weekend build event. What project would bring such an intriguing group of individuals together? 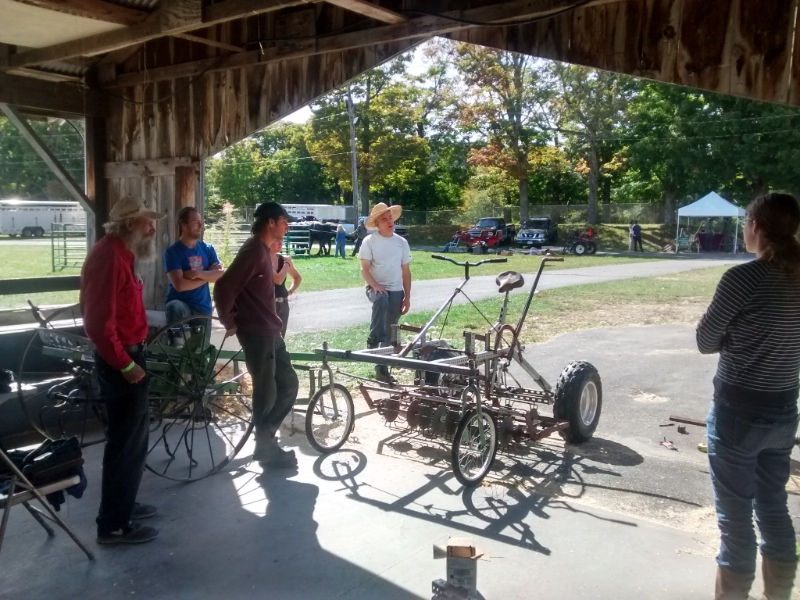 Only the culticycle, a pedal-powered cultivating tractor designed by Tim Cooke, that uses human brawn and bicycle brains to replace fossil fuel powered tractors for lightweight field cultivation. Farming with draft animals has been Donn Hewes life passion for the last 16 years. As Donn explains, time measurement is a major element to consider when using draft animals; “the first technologies came from labor saving.” However, one of the many reason why Donn looked to using draft animals was in reflection of the continual use of nonrenewable resources in farm machinery. In this video, Donn provides a comprehensive outline of how to integrate horses into your farming practices. From their wide variety of farm application to their ability to give back to the land in the form of manure, Donn emphasizes how farmers have the potential to maintain ecological integrity of their lands and create mutually respectful relationships with their draft animals. Donn Hewes and Maryrose Livingston own the Northland Sheep Dairy in Marathon, NY, where they milk 100% grass fed ewes and make farmstead cheese. Donn does all the farm work with horses and mules, and also teaches teamster skills to aspiring horse farmers. Donn is an active member of the Draft Animal Power Network, a not for profit organization promoting the use of horses, mules, and oxen in today’s farms and forests. 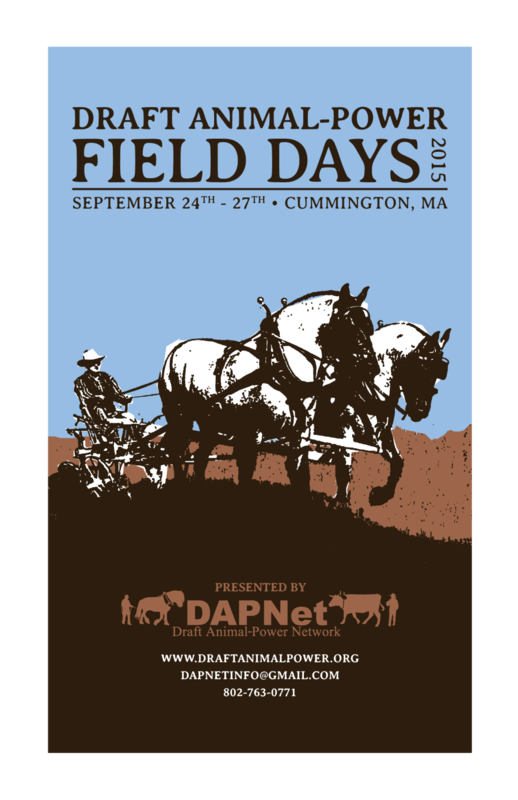 DAPNet will host the 2015 Draft Animal Power Field Days in Cummington, Mass. Sept 24th to 27th. Found on Page 148 in Local: The New Face of Food and Farming in AmericaSustainability for Ian means the ability to meet current needs without compromising those of future generations. Think about the Rio Declaration of 1992. Working with horses is one way Ian and Kelly try to keep that promise. They feel trends and benefit from the greater society like everyone else, but aren’t enslaved by the gas pump. Having horses insulate Ian from the inevitable fluctuations in the global economy.Horse powered means working with equines in a symbiotic agricultural relationship. They complete tasks which require great effort while sustaining themselves and us from the land. The Suffolk is one of the few popular draft breeds in North America that was developed by farmers for farming. Originally from England’s Suffolk county, these draft animals have especially short cannon bones (the bones just below the knees), meaning only minimal anatomical effort is required for them to take a step. This makes them efficient walkers capable of greater stamina. Plus, their level-headed attitude is founded on a sincere willingness to please. Aside from these exceptional qualities, they are the only draft breed which is always chestnut red in color. As a redhead himself, Ian finds them a wonderful choice functionally and aesthetically. Horses are solar-fueled, self-renewing, and somewhat self-repairing. “Meet the urban cousin of a traditional barn raising” says Yes! Magazine. Here is a story of a marginalized community in Cleveland taking urban farming to the next level. By incorporating a greenhouse design in their neighborhood, growing season can be dramatically extended. In collaboration with Fair Food Network, residents of the Cleveland neighborhood team up to build hoop houses, simple greenhouse designs that protect plants from the seasons and maintain a temperature at least 10 degrees warmer than outside temperatures. Here is an example of how growing in all four seasons is possible! Even in a city! Learn more from these Cleveland farmers! Low-Tech Magazine, an appropriate technology publication, proposes that the “key” to sustainable farming is recycling animal and human manure. Decker explains how the use of water closets, while convenient, breaks a cycle that could be returning essential nutrients to the soil, and instead pollutes our waterways, consumes large amounts of fresh water, and leaves an agricultural system that is dependent on synthetic fertilizer application, all while consuming large amounts of energy. Human excrement has not been ubiquitously regarded as “waste” — for thousands of years, China, Korea, and Japan treated it as a valuable trade product and fertilizer. Meanwhile, animal manure or food waste — even absent the taboo associated with humanure — is still wasted, often polluting our environment rather than healing our soil. To reintegrate food scraps and animal and human manure back into our agricultural system presents a huge logistical challenge. However, it is a challenge that can be overcome, but only if we begin to seriously address the issue. There are a variety of appropriate technologies that have been developed to compost human waste, from the DIY home scale to industrial scale technologies. Perhaps the most well known is Joe Jenkin’s open source Humanure Handbook. SOIL (Sustainable Organic Integrated Livelihoods) works in Haiti to provide access to low-cost ecological sanitation systems while simultaneously transforming human waste into compost that can help repair degraded soils. The Dutch company Orgaworld, meanwhile, creates compost from diapers and other organic waste on an industrial scale. Found on Page 176 in Local: The New Face of Food and Farming in AmericaPastures don’t just happen. They are like all biological systems, always in a state of flux between either degeneration or regeneration. Chickens are extremely hard on forage and dump hot manure with a carbon:nitrogen ratio of 7 to 1. As a result, stationary hen houses soon develop bare spots where the forage is tilled out and killed. The soil is overloaded with nitrogen toxicity which leaches into the groundwater and over stimulates grass clumps with bitter forage repugnant to the chickens. If you want a regenerating pasture, you have to manage it for that improvement or it will deteriorate.Egg mobiles are portable hen houses moved every one or two days, preferably behind herbivores, with chickens having access to unimpeded pasturage. Chickens are biological pasture sanitizers. They scratch through cow patties and spread them out, reducing the overload of nutrients in one spot and destroying the incubation environment conducive to parasite development; they eat fly larvae out of cow patties, thus reducing the irritation to the herd, increasing their comfort, health, and performance; chickens eat the newly exposed grasshoppers, crickets, and other herbivorous critters that compete that compete with the cows for the available forage; and chicken scratching pulls up duff and moldy leaves, aerating the soil and freshening the plant structure. Farms come in all shapes and sizes, and apply a variety of different principles and philosophies. As Nathanael Johnson writes, “there are farms that use all sorts of high technology to stay in sync with natural cycles, and even the best low-tech organic farmers find themselves fighting nature every year.” There is no such thing as one size fits all when it comes to farming strategies. Instead, it’s a matter of what makes sense — As Johnson points out, “[farmers] want the tools and techniques that will give them the best chance of success”. Have you been known as someone who “tinkers”? Do you like to “do it yourself”? Often times, we don’t even realize we’re participating in appropriate technology. It’s all about making the tools fit and work for you. Build your sustainable life! Sometimes it’s just easier to build it yourself. Take the project into your own hands! It’s all within arms reach with open source platforms, like Appropedia. Support another form of economic development. Support resourceful practices. Find a space to create. More and more “fab labs” are popping up to facilitate space for the inquisitive and investive to collaborate and share resources and knowledge.